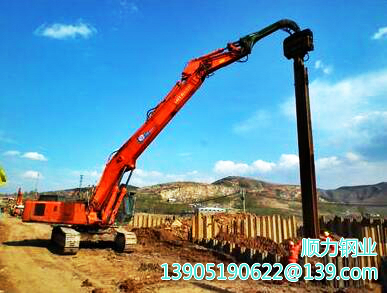 ln engineering practice, check the stability of the sheet piling protection is the design and calculation of engineering excavation is an important part of the whole safe and efficient construction process prerequisites and basic requirements. Including stability testing of two aspects of the verification: the stability Of the entire system, and check the anti-subversion check local stability. The utility program checks the stability of the entire system. The slip cycle topsoil is calculated as the effect of the support or bolt located on the surface side of the adjacent central wall. Surface of the well is different from the shore formed from the slip surface. In considering support, account of the stability of the entire test, you can use a simple way to check, because the design of the supporting role of the calculated has been Subject to global stability requirements involved in the supporting role. Check the local anti-subversion stability is to check the ambient torque support points active and passive under the pressure of the soil under the pillar is balanced, the mainstream media and the existence of the form Of safety hazards. When there is a support structure near a building and an underground pit, the deformation must be estimated to ensure that the safety of the ground and the deformation of the ground around the building and the pit shall be estimated on the basis of appropriate estimates of ground Conditions and local experience and experience Prediction of sheet pile deformation, strain plate piles is expected to be effective in preventing major accidents, due to the collapse of the project and lead to the stability of sheet pilings, but also help to develop appropriate Test and service life of sheet piling prediction. Monitoring refers to the subway and open process control construction of the soil characteristics of the excavation sky, the channel sheet piling cofferdam structure of the lateral movement and environmental conditions changes, a variety of observation and analysis, observation and timely feedback to guide the design And construction. Now, the use of computer monitors can provide stress and build system template deformation data and environmental conditions. As a result of improvements in information technology and reinforcement technology makes it possible to achieve a deformation control mm. If the groundwater level is high , Large hydropower, safety and economic considerations, the appropriate solution must be precipitated. The foundation of the whole construction process should be carried out throughout the displacement, settlement observation. And timely data to find feedback on the problem. Adjust the program, if necessary , Such a safety hazard to a minimum.